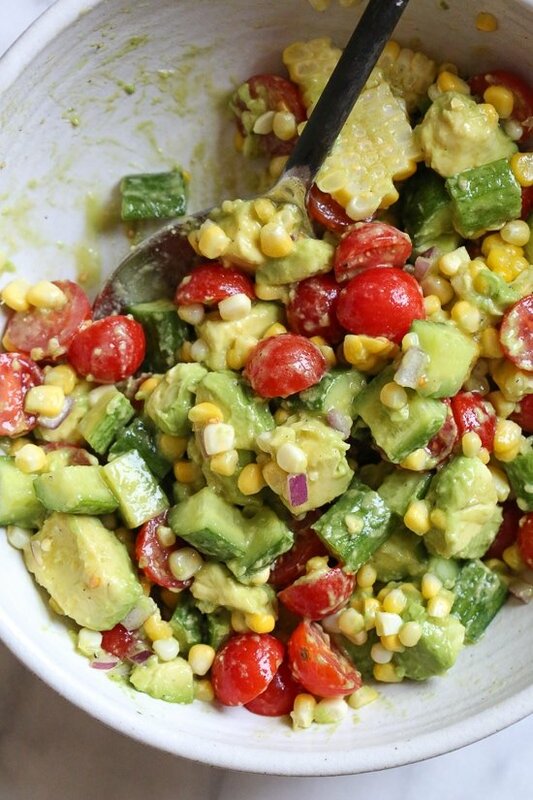 This Corn Tomato Avocado Salad is summer in a bowl! The perfect side dish with anything you’re grilling, or double the portion as a main dish. 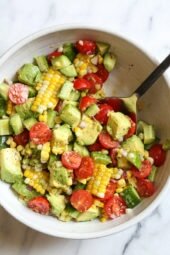 I am taking advantage of summer corn, tomatoes and cucumber and tossed them altogether with avocado for a fresh summer side dish! Other summer salads you may enjoy, this Grilled Corn Salad with Feta or this Corn Salsa with Lime! 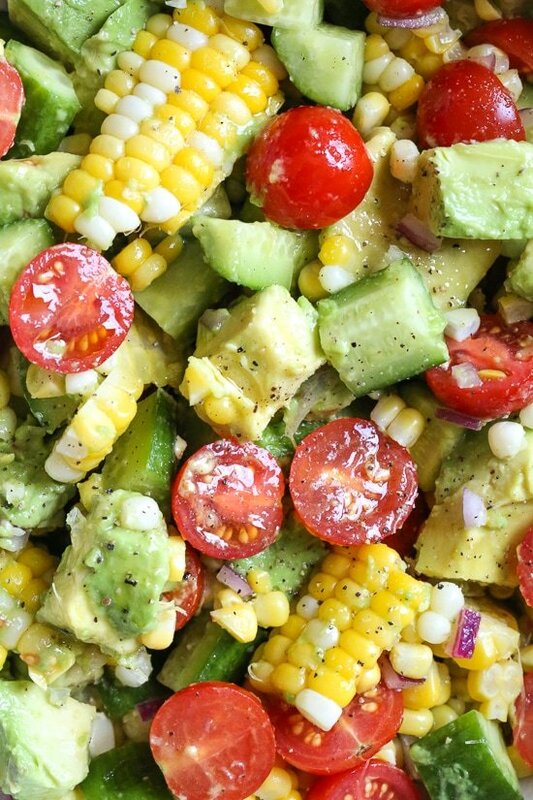 The avocado adds a lovely creaminess to the salad once you toss it all together. If you want to make this ahead, add the avocado just before serving. Grill the corn for a smoky flavor. Add fresh herbs such as basil or chives. Grill some chicken and shrimp and toss it together for a main dish. Toss all ingredients together and serve immediately. Enjoy! This was a great recipe. I made it last night. Delicious. Definitely one of my favorite recipes along with the very similar crab and avocado salad! Didn’t even need to change or add anything – it’s perfect on its own! This was so easy to make and made a bit hit with our buffet party! Delicious! Our vegan and non-meat eaters enjoyed it too! This is sooooo good. I love it, please never give this up, just keep giving us good stuff. Although, some of your recipes are a bit over my skill level, I still love your food. This is a real keeper. Outstanding. 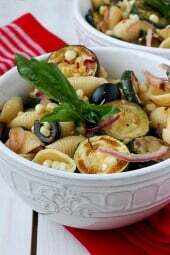 This may be my new favourite hearty summer salad recipe! Fast, easy, delicious, satisfying. Tweaked proportions slightly (a tad heavy on the onion and light on the tomato, for personal taste) but otherwise my only change was to sub good quality white balsamic for half the olive oil to cut calories a bit — no loss in flavor at all. Bright from the lemon and a little sea salt, creamy from the avocado, crunchy pops of onion … yummmm. Paired with chicken breasts in a shallot glaze it made a great weeknight dinner, and I think it would do quite well as a main course topped with spiced grilled shrimp. Ohhhh … or maybe a blackened salmon! Or jerk chicken. The creaminess of the avocado would really hold it’s own with alongside strong flavors. This is DEFINITELY going to be used often at my house. Thanks so much for sharing the recipe. This was great! I would love to see your spin on more plant-based (vegan) recipes like this! Your website, blogs, and recipes have helped me lose a total of 80 pounds over the past 4 years. I was incredibly over-weight and living a lifestyle that was really effecting my health. Your page helped me make the change and really learn a healthy, simple (but delicious!) way to cook.At any point in my health journey I’ve been able to come to your page and find whatever it is I was looking for (and then some!). Over the past month I’ve transitioned into a full vegan after a longtime vegetarian diet. I’m excited to see what other recipes I can find here on your amazing website. Just made this-came out great! This is such a great summer side salad! I have made it almost once a week this summer! My husband and I are at this moment eating this salad and it is so good! It is light and full of flavor! As a diabetic I am always looking for food I can eat that does not taste like cardboard. This is simply wonderful. 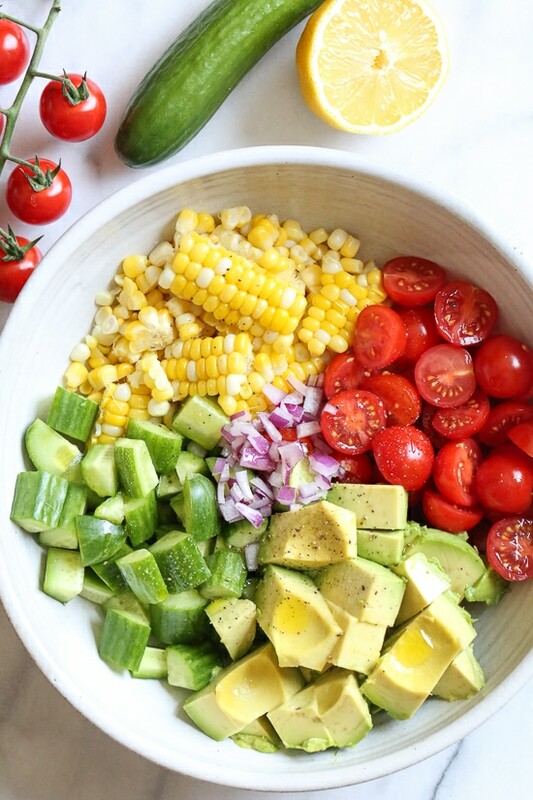 this Corn tomato avocado salad is truly a summer garden right in a bowl, but what i fail to understand is how are those corn stuck together even after tossing them because i have never seen anything like that before but this looks so healthy and yummy! I just signed up for WW, what are the difference between regular points, freestyle points and smart points? I seem to see them all referenced in your recipes and I want to make sure I enter them correctly into the app. I have made this several times this summer and my family loves it! So easy and fast. I use Trader Joe’s roasted corn and omit cucumbers because kids don’t like them and add fresh parsley from garden. Delicious, easy and refreshing! Thank you. I’ve made this twice this week. I used canned organic corn and added some chopped cilantro. I LOVE this dish. Tonight we added this to fish tacos. SO good. This salad was delicious! Can’t wait to have it for lunch tomorrow! Mmmmmm this looks so good and yummy! Definitely making it this week ? We received some fresh sweet corn from Iowa, so I wanted to make something other than corn-on-the-cob. Wow! I LOVE this recipe. It was so fresh and the dressing was perfect. I was afraid the lemon juice and olive oil mix was going to be bland, but it was just right, I could have eaten the whole bowl! Don’t wait to make this….get going with fresh, in-season ingredients. Made this last night & absolutely loved it! Thank you for another delicious recipe Gina!! THIS IS SO GOOOOOD! Definitely a keeper! Are you using recipe builder? Or calculator? This was fantastic. I admit I didn’t have all the ingredients. and omitted some- I used avocado, grape tomatoes halved, fresh corn off the cob and thinly sliced shallot. I then squeezed some fresh lemon all over it and added salt and pepper- it was so delicious! This was a KILLER salad. The lemon juice/olive oil dressing was a perfect complement to the avocado and roasted corn. I roasted the corn on the grill without the husks and with a little spray of olive oil. Also grilled a boneless skinless chicken breast and served it sliced on top of the salad. Definitely will make this again! I made this for a picnic and used the bottled key lime juice, everyone loved it! Oh, this is outstanding! I brought some to my sister-in-law across the street and now she will be making it as well. This will become a regular dish in our house. It says to serve immediately, but it was still good the next day, although a bit of liquid had leeched from the food and was at the bottom of the bowl. I ate it anyway, but next time I’ll pour it out. We made this salad as a side dish to some flank steak and hush puppies. OMG it was delicious. It’s definitely going to be a staple for the rest of the summer. Yum! I cannot believe how great this is– summer in a bowl! I think it will be on heavy rotation here, especially as my garden tomatoes ripen. Thanks, Gina!! YUM! Can I make this and eat leftovers? This seems like a combo of favorite things but I always have a really hard time keeping cut avocado fresh. Are there any tips for that or should I just wait to serve it to a group? Thanks! This is Fantastic! I made it last night and my hubby really liked it. I added 1 tablespoon of fresh cilantro and some diced grilled chicken. To please my husband I added one tablespoon of light sour cream. He likes a creamy dressing. I made this salad, tonight. It was easy, fresh and flavorful. It tasted like summer! 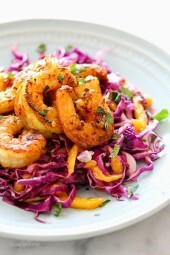 Just made this for dinner but added 3/4 Lb cooked shrimp and feta cheese! Awesome! Will be making this often throughout the summer! Thanks for sharing. I make variations of this all the time. I love to grill corn and other veggies and make a salad with them. The picture shows red onion, but the recipe does not list it in the ingredients. Is it included in the calorie count? I think red onion, or scallions, would add flavor – so I’m thinking the intention was for it to be there. This looks really delicious, and I’m sure I will be making it this week. 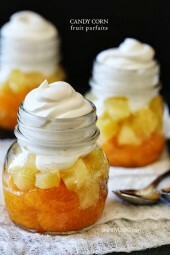 I am sooo making this ? adding purple onion…. The directions section is blank,. I am assuming just combine everything in a bowl and serve or does it need to chill? No need to steam or cook the corn!. I’ve been making this salad and versions of it for years. Sweet corn cut off the cob into a bowl (milk settles to the bottom). Add fresh tomato chucks (also sweet and local this time of year, Add salt and pepper – the salt will help to draw out some of the juices to form the basis of your “dressing”. Add avocado or not. Add fresh chopped basil on top before serving. Toss. Everyone will rave. No cooking required. Just fresh summer goodness in a bowl. I use one ear of corn for every large tomato. Makes two servings. This looks so delish! I’m sure it’s pretty simple but I didn’t see the directions? Can’t wait to make it! The photo shows what looks like red onion but I don’t see it listed in the ingredients. The directions (simple though they may be) are missing. Avocadoes are my favorite superfood because of its healthy fats and antioxidants. It also feels you up for longer periods of time. Thanks for sharing this recipe. Sweet corn doesn’t even need to be cooked for this. I LOVE raw sweet summer corn. So sweet, so crisp. This is delicious! Might add a little feta next time. Maybe some bacon too! This recipe is so fresh and delicious! Easy summer salad. Yum! How long does the corn need to be steamed for? I drop it in boiling water for 3 to 4 minutes. I have steamed it for 5 min.